Hey Coffeeholics! Christmas is nearly here! I remember when I was a kid, my parents would bring us to the carnival every Christmas! It was super fun because I was able to spend time with my family in fun and games and a lot of activities. Christmas is meant to be memorable. Make meaningful memories with your loved ones and at the same time make other kids happy too! Join the GKQC CARENIVAL! Its happening TOMORROW. If you once loved carnivals as a kid (or still do until now), share this delight to other children as Gawad Kalinga Quezon City (GKQC), in cooperation with The Expressions Company, brings Carenival, a day for the children of GKQC villages. 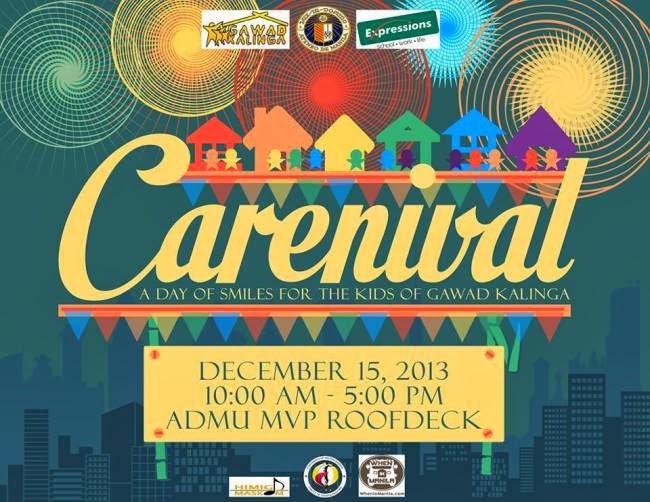 This will be on December 15, 2013 (Sunday) at the Ateneo de Manila University MVP – Roof Deck from 10 am to 5pm. Fun booths and a variety show will be setup to entertain more than 200 kids. Here are ways on how you can take part in this celebration of caring and sharing: Be a volunteer ate and kuya for a day! Everyone is welcome to meet and mingle with the kids. Bring your family and friends too! Donate in kind or in cash. Feeling like you need to outgrow your fascination over your precious Care Bear set, Voltes V action figures, or Barbie doll collection already? Donate them and bring joy to the beneficiaries’ faces. Excess toy donations will also be sent to the kids in areas affected by Typhoon Yolanda. Bring your toy donations on the event itself or leave them at UP Circle of Administrator’s designated drop-off points at UP Diliman NCPAG Lobby or UP Circa Tambayan, until December 13. Cash donations are also welcome and will be used to provide more materials for the children. Be a volunteer performer. Are you a puppeteer, magician, balloon twister or any kind of kiddie party performer? Share your talent to the kids and be their heroes! Gawad Kalinga (GK) is an organization geared towards building a nation empowered by people with faith and patriotism; a nation made up of caring and sharing communities, dedicated to eradicating poverty and restoring human dignity. Gawad Kalinga espouses volunteerism and relies on able and willing nation- builders in carrying out its mandate. In line with the mission of ending poverty for 5 million families by 2024, GK Youth Quezon City (the youth development arm of GK QC) takes care of 87 communities in the city. The team contributes to community development and youth empowerment through organizing monthly builds, holding of workshops for developing the youth, and undertaking various community-building events.